Always wanted blinking LED eyelashes? – ¿¡ tjongolongo ?! Well, you can now! Tjongolongo, these eyelashes are really something, they give a whole new meaning to false eyelashes. 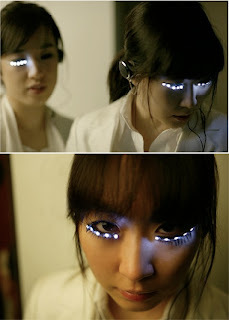 Made by the artist Soomi Park, these LED eyelashes light up when tilting your head. They use a set of headphones with a tilt sensor to enable this. The eyelashes appear to have been made because of the ‘obession’ for bigger eyes, or so it says in the video. Whatever the reason, I wouldn’t be surprised to seeing models walking with them on the runway or people using them when going clubbing. Depending on the costs and ease of use of these things, they can be a fun and freaky gadget to enhance your eyelashes!